Nikon has spent the last couple of years overhauling its professional camera line, and it's decided to kick off 2018 with a lens to match. The AF-S NIKKOR 180-400mm F4E TC1.4 FL ED VR is a super-telephoto zoom lens designed for FX-format bodies such as the D5 and D850. 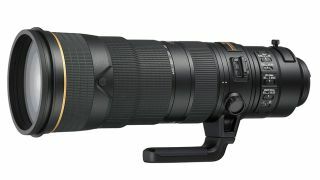 Intended for the sports and wildlife photography market, the lens officially succeeds the AF-S NIKKOR 200-400mm f/4G ED VR II and boasts a constant f/4 aperture throughout its entire zoom range. Arguably more noteworthy, however, is the fact that it's been designed with its very own teleconverter. Much like Canon's EF 200-400mm f/4L IS USM, the integrated 1.4x teleconverter can be kicked into use with simple flick of a switch. Here, it boosts the lens's 180-400mm focal length to 270-600mm, although those using it on DX-format bodies such as the D500 and D7500 will realise an effective focal range of 378-840mm. Thankfully, the lens also features a four-stop Vibration Reduction system to help keep everything sharp and stable throughout the focal length range, with Normal and Sports VR options selected through a switch on the side of the barrel. Magnesium-alloy casing has been used for strength and weight reduction, while protection against dust and water is provided though internal sealing and a water- and dust-repellant coating on the front element. On the inside, the 27-element, 19-group optical design includes a single flourite element and eight Extra Low Dispersion elements, together with Nano Crystal Coating technology. Other features include a nine-bladed diaphragm and a focus-limit control, as well as a Memory Recall switch. As you can imagine, this optic isn't designed for bargain hunters or those with just a casual interest in telephotography. With a suggested £10,999/$12,399.95/€12,400 asking price, it will likely only be snapped up by the lucky few. Fortunately, they won't have to wait too long to get their hands on a sample, with first stocks expected in March.